Don’t toss out your paper planner just yet. It appears that using both a smartphone and a paper planner is gaining in popularity. Michael Grothaus, a novelist, freelance journalist, wrote an article for the April 4, 2017 issue of Fast Company titled “What happened when I ditched my smartphone for a paper planner.” Of course he didn’t really ditch his smartphone, but he used a paper planner for recording his tasks and mapping out his intentions and reminders. He discovered that a trend was beginning to develop (among younger people no less) to revert to paper planners – probably reinforced by research that backs up what we paper planner advocates experienced over the years – that writing things down improves memory and recall of the items. It also creates order in your mind and you can recall the sequence of things you must do, and the relative importance and urgency of the items. Flipping back and forth through the pages keeps you on track and the cursive note-taking is tonic for the brain. Michael Grothaus did find it difficult to remember to bring his paper planner with him when he left for the office since he had built the habit of simply slipping his iPhone into his pocket. He also said he missed the audible reminder of an appointment 30 minutes in advance; bur soon noticed that by physically writing down the appointment he seldom needed a reminder. 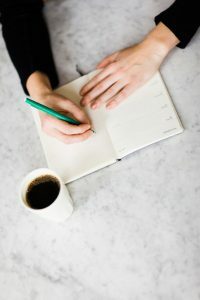 I have written many articles indicating various advantages of a paper planner, such as the journaling aspect, the ability to review what you have accomplished in the past and the importance of being able to budget your time without overwhelming yourself with a list of “To Do”s. But every time I did so, some people interpreted it as an attack on smartphones. In other words, I’m not suggesting everyone should toss away their smartphone when they start using a paper planner any more than I suggest people throw away their kitchen sink when they purchase a dishwasher. They each have their uses. I can no longer be accused of promoting paper planners simply because I sell one of my own. The Taylor Planner has gone the way of the Dodo bird. But I still maintain that for the activity of planning and scheduling, you can’t beat the paper planner. And I will continue to use one – even though the ones currently available may not serve me as well as the one I had tailored to my own needs. “To do” list or “Wish” list? Planning is the key. “To do” lists can be frustrating if not the stressful. They keep in mind those things you know you should be doing but don’t have time for. It would be less stressful to call them “Wish” lists. At least that way you wouldn’t feel guilty or suffer anxiety when they are postponed and you are not getting done those things you know should be done. Frustrated expectations cause anxiety and stress. The “To do” list or “Wish” list should be accompanies by a plan to get specific things done each day. Plans are frequently disrupted; but good plans are disrupted less frequently. Good plans involve prioritizing. 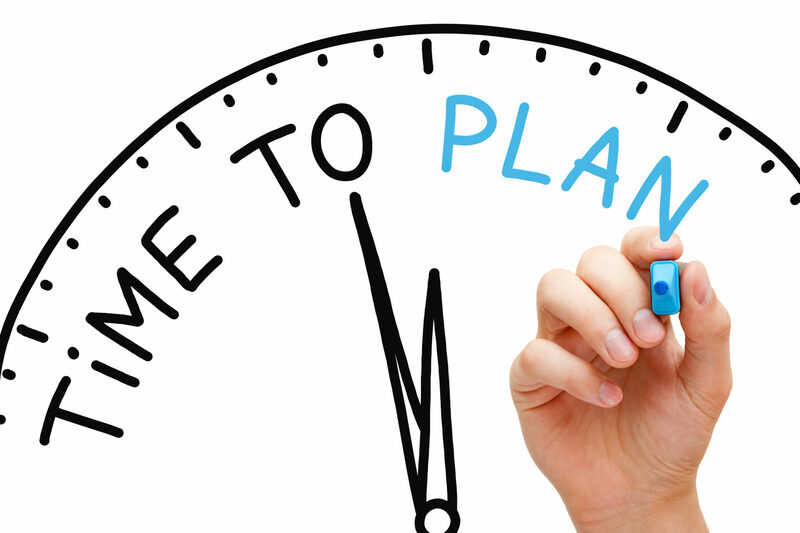 Select only those items that are both important and urgent and schedule time in your planner to get them done. It’s important to allow more time than you think they will take. Even then, these items should consume less than a day. If you have more items that are both important and urgent than you can do in a day, you are either exaggerating their importance or their urgency. “Important” means they have such innate value that you would suffer a significant loss of some kind or another if they were never done. “Urgent” means you cannot delay them more than a day before that loss occurs. If they are important only, you could allow as little as 15 minutes or half hour a day until they are done. If they are both important and urgent, and you cannot get them done in a day, you can minimize your losses by ignoring those of least importance. By ignoring, I mean deciding never to do them, removing them from your “Wish” list, and getting on with the things that you are actually able to do. Most of the important items will still offer some benefit if done at any time – usually less benefit the longer they are delayed. That’s why the habit of scheduling a little time each day until they are completed is usually an effective practice. If you can do it all with a smart phone, more power to you. I offer the following suggestions to my fellow hard-core paper planner users as well as the more gifted smart phone planner users. Don’t underestimate the time it will take for a task. Allow up to 50% more time than you think you will need. For example, if you think it will take an hour, block off an hour and a half. If you think it will take two hours, block off three hours; but break it into two timeslots of 90 minutes each. Working longer than 90 minutes without a break depletes energy and makes you more vulnerable to interruptions. Don’t record items in your planner and then forget about them. Refer to your planner and its scheduled activities and “Wish” list throughout the day. Make it a habit to refer to your planner after every completed task or activity. You wouldn’t drive through a strange country without constantly checking the map – so don’t drive through life without constantly checking your plan. Schedule items several days to a week in advance. Planning one day at a time is impossible since others will be asking for tomorrow’s time while you are working on today. With the rate at which priorities change, I would plan in detail only three or four days ahead. The farther into the future you plan, the fewer things you should enter into the planning section of your planning calendar. And only the really critical things are to be entered beyond a week ahead – in addition to those essential repetitive obligations, that is. The balance of any items remain on your “Wish” list, waiting to be scheduled, worked on during any spare time or abandoned. I find I find that scheduling at least three days ahead prevents me from making unnecessary commitments for those days when asked to do so. It’s easier to say “no” when you already have something scheduled at the requested time. It’s important to say no more often and reduce interruptions to a minimum as well; but that will be covered in a future blog article. Can I interrupt you for a minute? In his book, the Age of speed, Vince Poscente mentioned a study of office workers that found on average they spent only 11 minutes of a typical workday focused on a given task before they were interrupted. The real problem was that it took them nearly half an hour to return to the task, if they did at all. Constant Interruptions are a problem for many people. They are not only annoying and disruptive, they can put you behind in your work and cause stress. It’s important to determine why you are being interrupted and take action accordingly. For instance, if people keep walking into your office to consult you about something, can you have brief stand-up meetings every morning to keep everyone better informed or written policies and guidelines for them to follow? Do they interrupt you because you have supplies or materials located in your office or work area? Can you relocate them so they’re central to everyone? Or duplicate them. Make sure each person has the equipment and supplies needed. Are certain people more talkative than others? Probably 80% of your interruptions are from 20% of the people. If so, can you confront these individuals? Do they realize how their interruptions are affecting your work? In a high-tech world, people crave high-touch even more. Can you arrange to have a coffee with them at break time? Do you work in an open office with no privacy? Can you periodically work in a boardroom or a spare office? Can you work through the normal lunch hour and take a later lunch? Can you work flexible hours, coming in early and leaving early? Are the interruptions from telephones or e-mail? 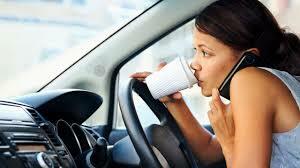 Can you engage the voice mail when you are working on your priorities and ignore e-mail until specific times? Some interruptions are inevitable and even essential so don’t get upset when you are interrupted. Just remember that in some cases that’s just your job calling. If you have allowed more time for the task than you thought it would take, you will still avoid the stress. 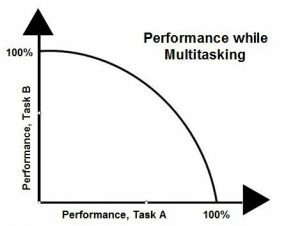 It makes sense that the longer you work on a specific task, the more chance you have of being interrupted by others and interrupting yourself. So schedule priority tasks in chunks of 90 minutes. Your energy and ability to concentrate rises and falls in 90 minute cycles. This is the continuation of the sleep cycle and I recommend 90-minute work sessions mainly for this reason. The most productive time of the day is 10:30 AM for most people so mornings should be reserved for priority work wherever possible. Early birds should start their major products even earlier. If you control your work location, take advantage of it. Some people work at home in the mornings; others work at a coffee shop. Choose a location where you can best concentrate on the task at hand without interruption. Regardless of where you work, it is important that you control the technology. Ignore the urge to send email or text messages while working on your scheduled project. Maintain focus on the task, jotting down ideas that pop into your mind without being detoured by them. Be sure to put your smart phone on airplane mode. Self-discipline or self-control, focus, attention, prioritizing and planning are essential if we are to remain effective in this digital age of speed. These are all functions of our executive center in the prefrontal cortex area of our brain. That’s why I claim that the battle against interruptions has shifted from the office to the brain. In my book, Strengthen your brain’s executive skills, published by Bookboon.com, I discuss how we can strengthen these cognitive skills, and in particular, those executive skills that are so critical to the effective use of our time. Deadlines can become your lifelines. Without deadlines, efficiency decreases and productive results are diminished. Opportunities are missed, projects are delayed, costs are increased, and procrastination is enabled. Without deadlines, Parkinson’s Law takes effect, and the tasks or activities take longer to complete. That’s why I recommend that people should schedule specific periods of time in their planner for important activities – blocks of time with both a beginning time and an ending time. The ending time is the deadline. Deadlines don’t cause stress; only unrealistic deadlines cause stress. That’s the reason I also recommend that you allow up to 50% more time than you think the task will take. I think it is odd that people feel it is impossible to predict that they will have time on Thursday morning between 10 AM and 11:30 AM to work on a major project or complete a task. And yet they think nothing of committing themselves to attend a meeting or sit with a supplier or participate in a performance review with the boss or even attended their child’s soccer game at that time. If it is important enough to you or the company, you can commit to it. That’s the reason I called “To do” lists intentions, and scheduled blocks of time commitments. Deadlines don’t cause urgency; deadlines help prevent urgency by allowing you to pace yourself by knowing how much time you have available to complete a task, and by starting and managing your time accordingly. Things become urgent when you either have no deadline or ignore it. I won’t dwell on the “good old days” as some octogenarians are prone to do. In fact some of the deadlines we were forced to adhere to were rather ridiculous by today’s standards. We had deadlines to be home after school and home from play at night at specific times. We had a deadline for bedtime, a deadline for arriving at school and so on. When we entered the job market as adults we had deadlines for starting work in the morning, returning from afternoon breaks, and for submitting reports. We had no trouble with self-imposed deadlines because we grew up with deadlines. Today things are different. We have flexible working hours and coffee breaks and no more “three lates and you’re disciplined” situations to deal with. There’s nothing wrong with that, because we are now more concerned with results, and not the number of hours worked. And if kids are continually late for school, we have research to prove that changing school hours will solve the problem. And if they’re late with reports, we recognize that all children are not alike, and adjust our teaching methods accordingly. In retrospect, both our parents and bosses were too strict, and a lot of the deadlines were unnecessary. But one thing they did was to provide the know-how and self-discipline to set deadlines on our own. We learned as children that we couldn’t finish our homework by bedtime if we spent most of the time playing marbles. And today that would translate into the knowledge that we can’t get our project done by Thursday if we spend most of the time checking email or searching the Internet. Deadlines can be lifelines – perhaps not a matter of life or death (although that’s possible); but in reducing stress, increasing personal productivity and avoiding some of the problems mentioned in the first paragraph. As we age, and certainly as we approach or pass the average life expectancy, we become more aware of the importance of getting things done on time. We won’t want to die without a Will or without having spent adequate time with our grandchildren or not having taken that cruise or trip out West or not having made clear to our loved ones how much we love and appreciate them. That will be our final deadline.